Conor McGregor scored a spectacular knockout in just 13 seconds Saturday night to claim the UFC Featherweight title and end Jose Aldo's long reign as champion. The outspoken Irishman (19-2) stopped Aldo (26-2) with a spectacular left hook to the jaw, making good on pre-fight jibes he'd end UFC 194 at Las Vegas' MGM Grand within the first round. "I did say that the right hand would be his downfall. I felt he would tense his body, he'd load the right hand and over-extend and I'd catch him," McGregor told ESPN after the fight. "If I say it's going to happen, it happens," he added. 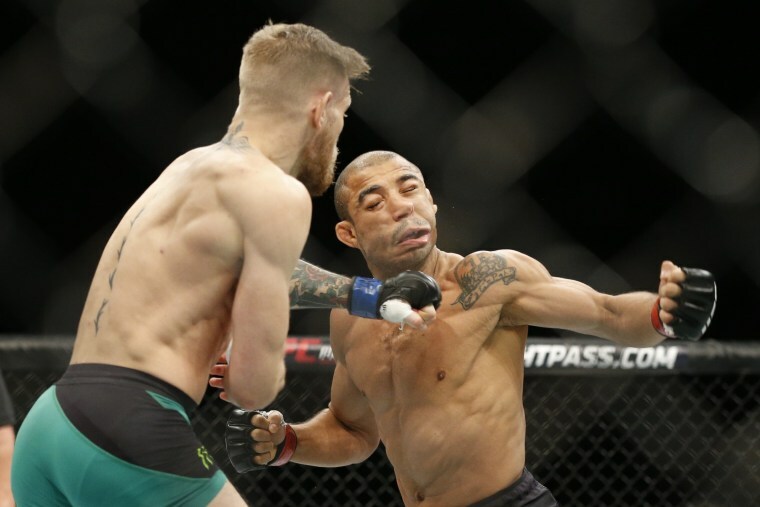 Aldo came at the 27-year-old Irishman with a right-left combo, the second of which he managed to connect — but McGregor returned with a powerful left, dropping the Brazilian champion senseless. The victory caps a stunning rise for "The Notorious," who'd said Aldo — previously unbeaten in a decade — was running scared when he'd pulled out of their fight in July with a rib injury. Aldo quickly declared that he wants a rematch, but whether he's given the chance remains to be seen — Frankie Edgar is in line for a title shot after victory in Friday night's The Ultimate Fighter 22 finale. McGregor, for his part, said he'd be willing to accommodate the Brazilian's request, telling ESPN that although he'd have claimed victory in any case, "you don't want to see it like that." Matthew Grimson is a London-based reporter and producer for NBCNews.com. He previously worked as a digital journalist for the Australian Broadcasting Corporation.